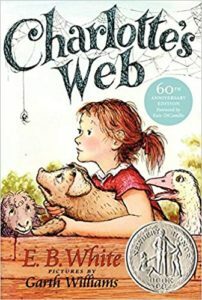 A few weeks ago I discovered that my 7th grader doesn’t know the story of Charlotte’s Web!! And so I went over to the bookshelf and pulled out the hardback copy my Grandma gave me for Christmas when I was 6 years old. What a sweet story of friendship, told through wonderful writing! As I read to the boys I stopped often to reflect on word choice and imagery. Beautiful. I’m only sorry that…..well. spider. phobia.